Serving American families since 1916, Piggly Wiggly is known for a rich history. The first Piggly Wiggly grocery store was founded in Memphis, Tennessee, and has since expanded to more than 600 locations in 17 states in the Midwest and Southern regions of the United States. One site, in particular, Piggly Wiggly Crestline in Mountain Brook, Alabama, operated for 30 years until the building’s lease was not renewed and the store was shut down. Crestline residents did not want to see their favorite “Pig” leave without putting up a fight. The community rallied for the “Pig” by creating a “Save the Crestline Pig” Facebook group and holding a fundraiser for the store’s employees. The store’s owner decided that the small, tight-knit community couldn’t lose their “Pig” and decided to buy property to build a new building to rehouse the cherished Piggly Wiggly store. 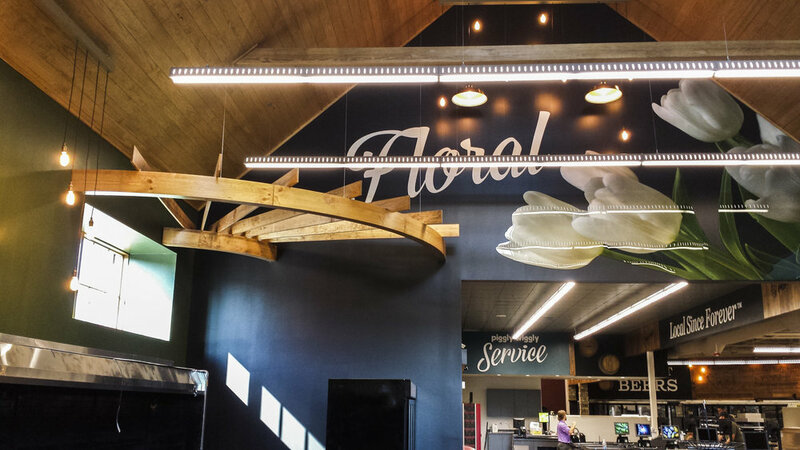 A new store meant new décor, so Decorworx was hired on to design the new Piggly Wiggly’s interior. Piggly Wiggly, known for convenience, friendliness, and a neighborhood market for the local community, claims that “[they] have the nicest employees you’ll ever meet”, that “[they] listen, [they] are there, and [they] are the social aspect of people’s lives”, and that the store is a “throwback to a kinder, earlier time”. Piggly Wiggly is considered a simple, elegant location that allows the community to gather, visit, feel welcome and buy food, flowers, and wine. The design of Piggly Wiggly Crestline is centered around this statement. The wine department was modeled to look like a Tuscan wine cellar, complete with plaster walls and authentic stone archways. Large, beautiful murals were placed on the valances to promote the store’s food and products. A rich, sophisticated color palette combined with a simple wood texture created a rustic, yet fresh hand-crafted feeling to highlight the artisan and crafted items that are sold in the store. Upon opening, customers were ecstatic that their efforts worked in bringing back their cherished Piggly Wiggly to their small town. After being relocated to a new location, Piggly Wiggly Crestline will once again continue to maintain a strong presence in the Mountain Brook community for the years to come.